Qigong, chi kung, or chi gung (simplified Chinese: 气功; traditional Chinese: 氣功; pinyin: qìgōng; Wade–Giles: chi4 gong1; literally “Spirit Achievement”) is a practice of aligning breath, movement, and awareness for exercise, healing, and meditation. With roots in Chinese medicine,martial arts, and philosophy, qigong is traditionally viewed as a practice to cultivate and balance qi (chi) or what has been translated as “intrinsic life energy”. Typically a qigong practice involves rhythmic breathing coordinated with slow stylized repetition of fluid movement, a calm mindful state, and visualization of guiding qi through the body. Qigong is now practiced throughout China and worldwide, and is considered by some to beexercise, and by others to be a type of alternative medicine or meditative practice. From a philosophical perspective qigong is believed to help develop human potential, allow access to higher realms of awareness, and awaken one’s “true nature”. Qi (or chi) is usually translated as life energy, lifeforce, or energy flow, and definitions often involve breath, air, gas, or relationship between matter, energy, and spirit. 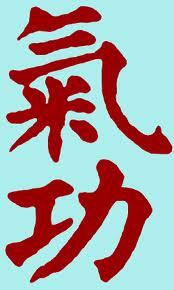 Qi is the central underlying principle in traditional Chinese medicine and martial arts. Gong (or kung) is often translated as cultivation or work, and definitions include practice, skill, mastery, merit, achievement, service, result, or accomplishment, and is often used to meangongfu (kung fu) in the traditional sense of achievement through great effort. (see MDBG dictionary entry) The two words are combined to describe systems to cultivate and balance life energy, especially for health. Although the term qigong (氣功) has been traced back to Taoist literature of the early Tang Dynasty (618-907 AD), the term qigong as currently used was promoted in the late 1940s through the 1950s to refer to a broad range of Chinese self-cultivation exercises, and to emphasize health andscientific approaches, while de-emphasizing spiritual practices, mysticism, and elite lineages.